We’ve launched a large number of new features over the last few weeks, so we decided it was also a great time for a new custom marketing flyer for our member or employee perks programs. 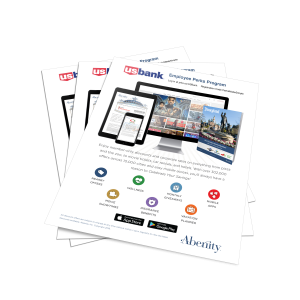 The new flyer is now available for you to download from within the Marketing Gallery of the Abenity Back Office. When it comes to engagement, email still produces the best results, and flyers are perfect for break rooms, new hire kits, employee handbooks, benefits fairs, social events, and more! If you’re looking for ways to better engage your group, then please let us know! We’d love to hop on a call to learn more about you and your goals.